When darkness falls upon the city, only one heroic duo has the pedigree to deliver justice! 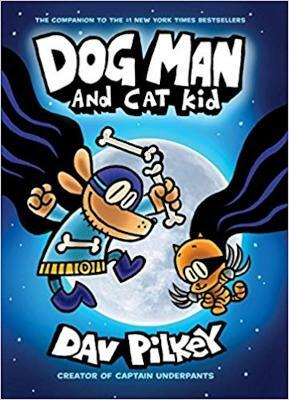 Dog Man, the newest hero from the creator of Captain Underpants, is back and this time he's not alone. The heroic hound with a nose for justice now has a sidekick in the form of a super-cu... read full description below. Hot diggity dog! Dog Man, the newest hero from the creator of Captain Underpants, is back and this time he's not alone. The heroic hound with a real nose for justice now has a sidekick in the form of a super-cute kitten, and together they have a mysterious caper to sniff out! When a new kitty sitter arrives and a glamorous movie starlet goes missing, it's up to Dog Man and Cat Kid to save the day! Will these heroes stay hot on the trail, or will they be thrown off the scent and start barking up the wrong tree?